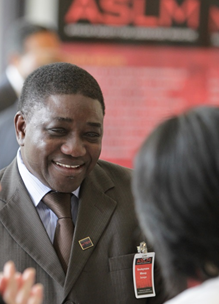 Souleymane Mboup, PhD, is a world-renowned researcher, professor and key member of the ASLM team, serving as a member of the Board of Directors, as a Senior Editor for the African Journal of Laboratory Medicine, and as member of the ASLM2014 Scientific Committee. In a recent interview with ASLM, Prof. Mboup spoke of his current efforts in research, surveillance, education and capacity-building, as well as of his role in ASLM and hopes for the ASLM2014 conference. Could you tell us a little about your role at Cheikh Anta Diop University in Dakar? At the university level, I’m the Head of the Bacteriology-Virology Laboratory at le Dantec Hospital in Dakar, which is a teaching hospital of Cheikh Anta Diop University. The Bacteriology-Virology Laboratory is Senegal’s reference laboratory, and here we perform research on HIV/AIDS and sexually transmitted diseases. I teach at the hospital laboratory, as well as perform medical research. I coordinate many activities, including at the national level with disease surveillance and monitoring programmes, and at the regional level where I coordinate regional health networks. Regionally, I work with the West African Network of Excellence for TB, AIDS and Malaria (WANETAM) and am the coordinator for West Africa Project Fair’s (WAPF) HIV research and prevention efforts. WANETAM is a collaborating centre for both UNITAID and ASLM, so I am also involved in coordinating cooperative efforts. I also engage in surveillance, education and capacity-building efforts. Capacity building is very important, as is surveillance, at the national and regional levels. At the university, we offer a specialised degree in biological retrovirology. What are your principal research efforts at Cheikh Anta Diop University? We are medical microbiologists, so we do a lot of research on infectious diseases. Much of our work has been on HIV, particularly because we co-discovered HIV-2 in collaboration with Harvard University and the Universities of Tours and Limoges in France. We do a lot of research on HIV in general, but also on the issue of HIV drug-resistance. We also research tuberculosis and the potential for a TB vaccine. In addition, we perform research on malaria with the Harvard School of Public Health and are conducting research projects on drug-resistant malaria. So, for the most part our work focuses on the big three diseases: HIV, TB and malaria. Are you currently working on any particularly interesting research projects that you would like to discuss? We are engaged in many interesting projects on HIV, examining the interaction between HIV-1 and HIV-2, looking into vaccines, and studying the genetic diversity of HIV and its development of drug resistance. With TB, we are doing work on the TB vaccine candidate MVA85A, which was developed by Oxford, looking at the vaccine’s efficacy in adults. Furthermore, we are researching malaria and malaria drug resistance, as I mentioned before. In addition to research, our laboratory is working with the US Centers for Disease Control and Prevention (CDC) to assure the quality of laboratory services through proficiency testing (PT). We provide quality assurance services to nearly 400 laboratories in Africa, making sure that laboratory products and services are accurate. Furthermore, we’re active in promoting scientific training and leadership, demonstrating African leadership in education, research, PT and capacity building. What are the greatest challenges to laboratory services and research in Africa, in your opinion? The biggest challenge is a lack of means. Laboratories need equipment and resources to function correctly, and unfortunately laboratories are the least prioritised aspect of the healthcare system. Many laboratories are underequipped and underfinanced, and thus lack the capacity to achieve international quality standards. Inadequate resources are also an issue in African research laboratories, which often lack the means to perform good research and build up strong research teams. That’s why laboratory development initiatives offered through organisations such as ASLM are so important, as they stress quality improvement activities and strengthen laboratory safety. The new Diagnostics Access Initiative, launched by the World Health Organisation (WHO), the Joint United Nations Programme on HIV/AIDS (UNAIDS), CDC, ASLM, the Clinton Health Access Initiative (CHAI), and others, is very important for developing laboratory medicine; without the laboratory, quality healthcare cannot exist. How have diagnostic and research laboratories evolved over the past 10-15 years? There have been different programmes spearheaded by organisations like WHO and CDC, which have aided laboratory development in certain African countries. Programmes supporting laboratory accreditation, such as SLIPTA (Stepwise Laboratory Quality Improvement Process Towards Accreditation) and SLMTA (Strengthening Laboratory Management Toward Accreditation), have helped increase the number of internationally accredited laboratories on the continent. Unfortunately, because many national laboratory development programmes are supported by outside organisations, major improvements have been observed only in specific countries and do not apply to the continent as a whole. What is your role in ASLM and in ASLM2014? I am a member of the ASLM Board of Directors, which makes major decisions about the goals and activities of the Society. I am also on the ASLM2014 Scientific Committee, which is responsible for planning and organising the conference’s scientific programme. Furthermore, I am a Senior Editor for the African Journal of Laboratory Medicine (AJLM), and I help support the journal’s publication. In my roles in ASLM, I strive to boost involvement of the francophone African laboratory community, as I believe that francophone African leadership is essential. I also try to mobilise stakeholders at the political and scientific levels to participate in the ASLM2014 conference. What are your hopes and expectations for the ASLM2014 conference? The ASLM2012 conference was a great success and offered many different perspectives. The conference was good for the visibility of ASLM and of the laboratory medicine field, convening different scientific specialists and providing great networking opportunities. My hope for ASLM2014 is that it builds upon the last conference’s scientific expertise and opportunities for collaboration. ASLM needs to maintain the momentum created during ASLM2012 by showing conference participants that the Society continues to be a success and continues to advance laboratory medicine. I also hope that ASLM2014 garners the participation of many different countries and represents the interests and needs of Africa’s many cultures and languages.